With forest fires destroying large parts of California and other parts of the western United States, today's story reminds us summer's heat is the least of what could be happening. Back in 2010 I had a house flood. Nothing on the scale of what's going on in Baton Rouge currently, nor Hurricane Sandy, which hit in 2012, but I encourage people to check out my earlier disaster segments here since, from time to time, disasters change our lives. Whether total loss or adjusting to the chaos of any major crisis, I tried to find as many ways for working through it all from others who had the same or worse events. Right now I'm reading Wayne Muller's A Life of Being, Having, and Doing Enough. In some cases I wish I could sit with Muller and disagree or question some of what he says, but on pages 136 and 137 is "What Grows After a Fire" and he talks about visiting an area only three weeks after a major fire destroyed dozens of homes. Already, in the midst of the blackened refuse was a sea of green from 6 to 10" oak seedlings blanketing the forest floor without human interference. 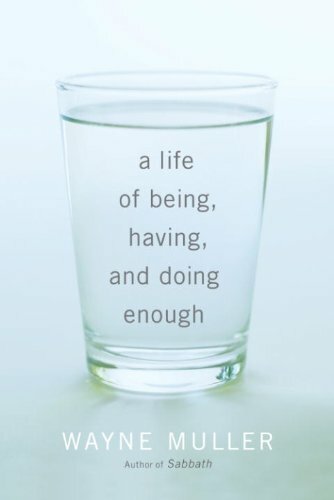 His conclusion is that life is like this and "When we learn this, when we finally realize who we are, what we know, and of what we are truly capable, any fear of never having enough of anything gradually and inevitably falls away." After today's story I will mention some Michigan forest fires mainly pre-dating the U.S. Forest Service. I initially thought today's story was about an incident experienced by the great ornithologist, John James Audubon. 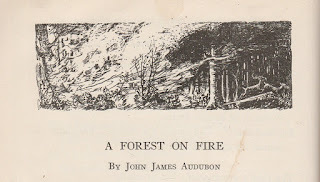 I found "A Forest on Fire" in Story Hour Readings, Fifth Year, which was part of a series for 1921 readers by educator, Ernest Clark Hartwell, for the American Book Company. Hartwell gives some sources on his Acknowledgements page, but gave only a by-line attributing it to Audubon. Of course that sent me hunting. Audubon's Wikipedia article gave me a clue it might have happened while he lived in Kentucky. Prowling Project Gutenberg, I found the story in Audubon and His Journals, volume 2 by Maria R. Audubon. (This is the continuation of the Missouri River journals by John James Audubon in volume 1.) 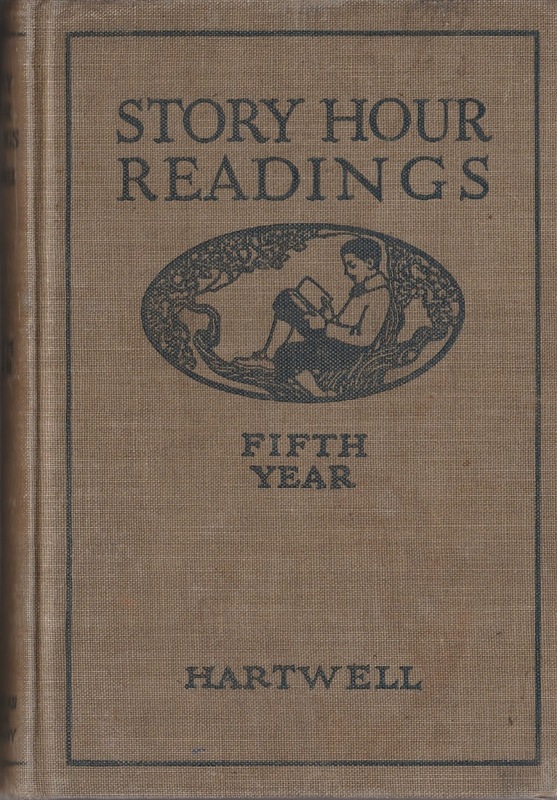 The problem is Hartwell's reader simplifies the story and also doesn't explain this is a story told to Audubon by an unnamed hunter in Maine talking about an incident with his equally anonymous wife and daughter. It's still a worthwhile story and, to identify where the actual story started in the reader, I'll give the introductory phrase in red. I can't even identify the illustrator for the story's header as the title page explains. 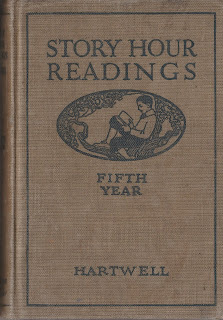 By the way, as of this writing there are other years of the Story Hour Readings online, but not yet the Fifth Year. The reader's version is easier to tell. If you would like me to scan it and send you a copy, email me with Forest Fire Story Request in the Subject line. THE BURNING OF THE FORESTS. With what pleasure have I seated myself by the blazing fire of some lonely cabin, when, faint with fatigue, and chilled with the piercing blast, I had forced my way to it through the drifted snows that covered the face of the country as with a mantle. The affectionate mother is hushing her dear babe to repose, while a group of sturdy children surround their father, who has just returned from the chase, and deposited on the rough flooring of his hut the varied game which he has procured. The great back-log, that with some difficulty has been rolled into the ample chimney, urged, as it were, by lighted pieces of pine, sends forth a blaze of light over the happy family. The dogs of the hunter are already licking away the trickling waters of the thawing icicles that sparkle over their shaggy coats, and the comfort-loving cat is busied in passing her furry paws over each ear, or with her rough tongue smoothing her glossy coat. I recollect that once while in the State of Maine, I passed such a night as I have described. Next morning the face of nature was obscured by the heavy rains that fell in torrents, and my generous host begged me to remain, in such pressing terms that I was well content to accept his offer. 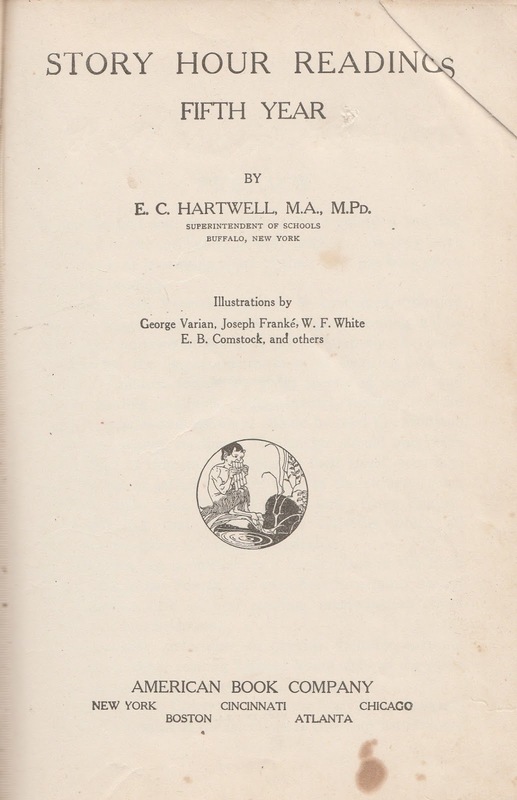 Breakfast over, the business of the day commenced; the spinning-wheels went round, and the boys employed themselves, one in searching for knowledge, another in attempting to solve some ticklish arithmetical problem. In a corner lay the dogs, dreaming of plunder, while close to the ashes stood grimalkin, seriously purring in concert with the wheels. The hunter and I seated ourselves each on a stool, while the matron looked after her domestic arrangements. "About twenty-five years ago the larch, or hackmatack, trees were nearly all killed by insects. This took place in 296 what hereabouts is called the 'black soft growth' land, that is, the spruce, pine, and all other firs. The destruction of the trees was effected by the insects cutting the leaves, and you must know that, although other trees are not killed by the loss of their leaves, the evergreens always are. Some few years after this destruction of the larch, the same insects attacked the spruces, pines, and other firs, in such a manner that, before half a dozen years were over, they began to fall, and, tumbling in all directions, they covered the whole country with matted masses. You may suppose that when partially dried or seasoned, they would prove capital fuel, as well as supplies for the devouring flames, which accidentally, or perhaps by intention, afterwards raged over the country, and continued burning at intervals for years, in many places stopping all communication by the roads; the resinous nature of the firs being of course best fitted to insure and keep up the burning of the deep beds of dry leaves or of the other trees." Here I begged him to give me some idea of the form of the insects which had caused such havoc. "The insects," said he, "were, in their caterpillar form, about three quarters of an inch in length, and as green as the leaves of the trees they fed on, when they committed their ravages. I must tell you also that, in most of the places over which the fire passed, a new growth of wood has already sprung up, of what we lumberers call hard wood, which consists of all other sorts but pine or fir; and I have always remarked that wherever the first natural growth of a forest is destroyed, either by the axe, the hurricane, or the fire, there springs up spontaneously another of quite a different kind." I again stopped my host to inquire if he knew the method or nature of the first kindling of the fires. "Why, sir," said he, "there are different opinions about this. Many believe that the Indians did it, either to be the better able to kill the game, or to punish their 297 enemies the Pale-faces. My opinion, however, is different; and I derive it from my experience in the woods as a lumberer. I have always thought that the fires began by the accidental fall of a dry trunk against another, when their rubbing together, especially as many of them are covered with resin, would produce fire. The dry leaves on the ground are at once kindled, next the twigs and branches, when nothing but the intervention of the Almighty could stop the progress of the fire. "In some instances, owing to the wind, the destructive element approached the dwellings of the inhabitants of the woods so rapidly that it was difficult for them to escape. In some parts, indeed, hundreds of families were obliged to flee from their homes, leaving all they had behind them, and here and there some of the affrighted fugitives were burnt alive." At this moment a rush of wind came down the chimney, blowing the blaze of the fire towards the room. The wife and daughter, imagining for a moment that the woods were again on fire, made for the door, but the husband explaining the cause of their terror, they resumed their work. "It is a difficult thing, sir, to describe, but I will do my best to make your time pass pleasantly. We were sound asleep one night in a cabin about a hundred miles from 298 this, when, about two hours before day, the snorting of the horses and lowing of the cattle which I had ranging in the woods suddenly awakened us. I took yon rifle and went to the door, to see what beast had caused the hubbub, when I was struck by the glare of light reflected on all the trees before me, as far as I could see through the woods. My horses were leaping about, snorting loudly, and the cattle ran among them with their tails raised straight over their backs. On going to the back of the house, I plainly heard the crackling made by the burning brushwood, and saw the flames coming towards us in a far extended line. I ran to the house, told my wife to dress herself and the child as quick as possible, and take the little money we had, while I managed to catch and saddle the two best horses. All this was done in a very short time, for I guessed that every moment was precious to us. "We then mounted, and made off from the fire. My wife, who is an excellent rider, stuck close to me; my daughter, who was then a small child, I took in one arm. When making off as I said, I looked back and saw that the frightful blaze was close upon us, and had already laid hold of the house. By good luck, there was a horn attached to my hunting-clothes, and I blew it, to bring after us, if possible, the remainder of my live stock, as well as the dogs. The cattle followed for a while; but, before an hour had elapsed, they all ran as if mad through the woods, and that, sir, was the last of them. My dogs, too, although at other times extremely tractable, ran after the Deer that in bodies sprung before us, as if fully aware of the death that was so rapidly approaching. "We heard blasts from the horns of our neighbors as we proceeded, and knew that they were in the same predicament. Intent on striving to the utmost to preserve our lives, I thought of a large lake some miles off, which might possibly check the flames; and, urging my wife to 299 whip up her horse, we set off at full speed, making the best way we could over the fallen trees and brush-heaps, which lay like so many articles placed on purpose to keep up the terrific fires that advanced with a broad front upon us. "By this time we could feel the heat; and we were afraid that our horses would drop every instant. A singular kind of breeze was passing over our heads, and the glare of the atmosphere shone over the daylight. I was sensible of a slight faintness, and my wife looked pale. The heat had produced such a flush in the child's face that when she turned towards either of us, our grief and perplexity were greatly increased. Ten miles, you know, are soon gone over on swift horses; but, notwithstanding this, when we reached the borders of the lake, covered with sweat and quite exhausted, our hearts failed us. The heat of the smoke was insufferable, and sheets of blazing fire flew over us in a manner beyond belief. We reached the shores, however, coasted the lake for a while, and got round to the lee side. There we gave up our horses, which we never saw again. Down among the rushes we plunged by the edge of the water, and laid ourselves flat, to wait the chance of escaping from being burnt or devoured. The water refreshed us, and we enjoyed the coolness. "On went the fire, rushing and crashing through the woods. Such a sight may we never see! The heavens, themselves, I thought were frightened, for all above us was a red glare mixed with clouds of smoke, rolling and sweeping away. Our bodies were cool enough, but our heads were scorching, and the child, who now seemed to understand the matter, cried so as nearly to break our hearts. "The day passed on, and we became hungry. Many wild beasts came plunging into the water beside us, and others swam across to our side and stood still. Although 300 faint and weary, I managed to shoot a Porcupine, and we all tasted its flesh. The night passed, I cannot tell you how. Smouldering fires covered the ground, and trees stood like pillars of fire, or fell across each other. The stifling and sickening smoke still rushed over us, and the burnt cinders and ashes fell thick about us. How we got through that night I really cannot tell, for about some of it I remember nothing." Here the hunter paused, and took breath. The recital of his adventure seemed to have exhausted him. His wife proposed that we should have a bowl of milk, and the daughter having handed it to us, we each took a draught. "Now," said he, "I will proceed. Towards morning, although the heat did not abate, the smoke became less, and blasts of fresh air sometimes made their way to us. When morning came, all was calm, but a dismal smoke still filled the air, and the smell seemed worse than ever. We were now cooled enough, and shivered as if in an ague fit; so we removed from the water, and went up to a burning log, where we warmed ourselves. What was to become of us, I did not know. My wife hugged the child to her breast, and wept bitterly; but God had preserved us through the worst of the danger, and the flames had gone past, so I thought it would be both ungrateful to him and unmanly to despair now. Hunger once more pressed upon us, but this was easily remedied. Several Deer were still standing in the water, up to the head, and I shot one of them. Some of its flesh was soon roasted; and after eating it we felt wonderfully strengthened. "By this time the blaze of the fire was beyond our sight, although the ground was still burning in many places, and it was dangerous to go among the burnt trees. After resting awhile, and trimming ourselves, we prepared to commence our march. Taking up the child, I led the way over the hot ground and rocks; and, after two weary days and nights, during which we shifted in the best 301 manner we could, we at last reached the 'hard woods' which had been free of the fire. Soon after we came to a house, where we were kindly treated for a while. Since then, sir, I have worked hard and constantly as a lumberer; but, thanks be to God, here we are safe, sound, and happy!" All that talk about the hunter now calling himself a lumberer brings me to thinking about the List of Michigan wildfires and in 1881 how it changed the face of Michigan's Thumb area into cleared farmland. Ten years earlier, on October 8, 1871, at the very same time everybody's attention was switched to the Great Chicago Fire (so familiarly attributed by a song to Mrs. O'Leary's cow kicking a lantern over), the Upper Peninsula of Michigan and on into Wisconsin with the Peshtigo Fire, came history's deadliest wildfire. It even left evidence in concrete reminiscent of the atomic bomb. I read books about that fire and was impressed to learn it not only was missed because of Chicago's disaster, but it was also on the same day as a fire across the bay in Wisconsin's Door Peninsula and several locations in Michigan at Holland, Manistee, and Port Huron. Here it was just called the Great Michigan Fire. It's been a long time since I grew up hearing Smokey the Bear cautioning us about not carelessly starting fires. Even that bit of official public service announcement gathered a story, after the fact, when a black bear cub was rescued after being rescued from a New Mexico wildfire. Of course the cub was later named Smokey after the advertising mascot. He lived a long and apparently happy life at the National Zoo. The hotlink manages to give even more information about him. Nowadays, while careless fires still can start devastating fires, controlled burns supposedly eliminate the brush that can fuel a wildfire. I remember walking my dog past one at Orion Oaks Park and seeing an emerald green snake gasping at the edge of the burn. He was half burnt up. The next time I walked there he was gone. Probably eaten. Rather like the story of the unknown hunter who told his story to Audubon and killed a deer after the fire was over. Today's story was long, but I want to include this is part of a series of postings of stories under the category, "Keeping the Public in Public Domain." The idea behind Public Domain was to preserve our cultural heritage after the authors and their immediate heirs were compensated. I feel strongly current copyright law delays this intent on works of the 20th century. My own library of folklore includes so many books within the Public Domain I decided to share stories from them. 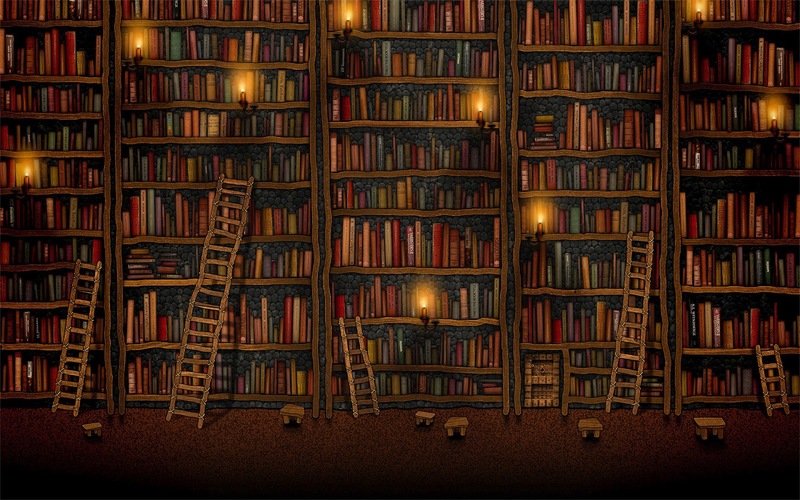 I hope you enjoy discovering new stories.